At the beginning of the month I went to see the last of Betsy Bloomingdale’s gems going to the auction block at Christie’s. The bulk of her jewelry was sold in December during Christie’s Magnificent Jewels auction. I’ve showed some of the jewelry on Instagram but I wanted to do a longer post on her couture gowns that were also being sold. There were just a handful on view and I found them to be great examples of the work of three of the most important designers of the 20th century—Marc Bohan for Christian Dior, Valentino, and Oscar de la Renta. It was like a little couture capsule! Betsy was the wife of Alfred Bloomindale, who was credited with creating the credit card, and grandson of one of the founders of Bloomingdale’s. Betsy was also a close friend of Nancy Reagan. I don’t know all that much about her but it is clear from the objects she owned that she was an entertaining powerhouse. There was her garden furniture and books and dishes and décor on display at Christie’s but I headed straight to Betsy’s closet! A 1991 Christian Dior gown. Betsy was definitely a Dior girl. Most of the couture on display was by Marc Bohan for Dior and it’s wonderful to see how these gowns, created in the mid-80s and early 90s, are still in perfect condition. I think for the most part they could still be worn today! I loved that she had written on gold-edged note cards when and where she had worn the dresses. Places where she wore it. She made good use of it! A Fall/Winter 1986-87 gown of purple silk faille by Marc Bohan for Dior. I love the back of this gown. This photo is for the fabric lovers out there. Look at the color and detail! Notes on the use of the gown. This was also worn six times, like the Dior above. A red satin and crepe Valentino gown. I loved the Valentino bouclé suit above, particularly for its cuffs and skirt hem. The petals are made of stiff organza (and Valentino used this technique in his couture gowns on occasion too). I couldn’t resist touching one. They are are light but strong! I love the way they look and the feminine feel they give the suit. A gown by Oscar de la Renta. ...I also love a bejeweled bow. An orange 1986 silk gown by Marc Bohan for Christian Dior. This was worn to a State Dinner at the White House. I found a great picture of Betsy with her granddaughters in 2009 when an exhibit was opened at the Fashion Institute of Design & Merchandising in Los Angeles, celebrating Betsy’s couture style. I loved that her orange Dior gown, originally created in 1986, was still going strong, and she looked wonderful in it! Betsy in her Dior, with her granddaughters in LA! October 2009. Photo credit. 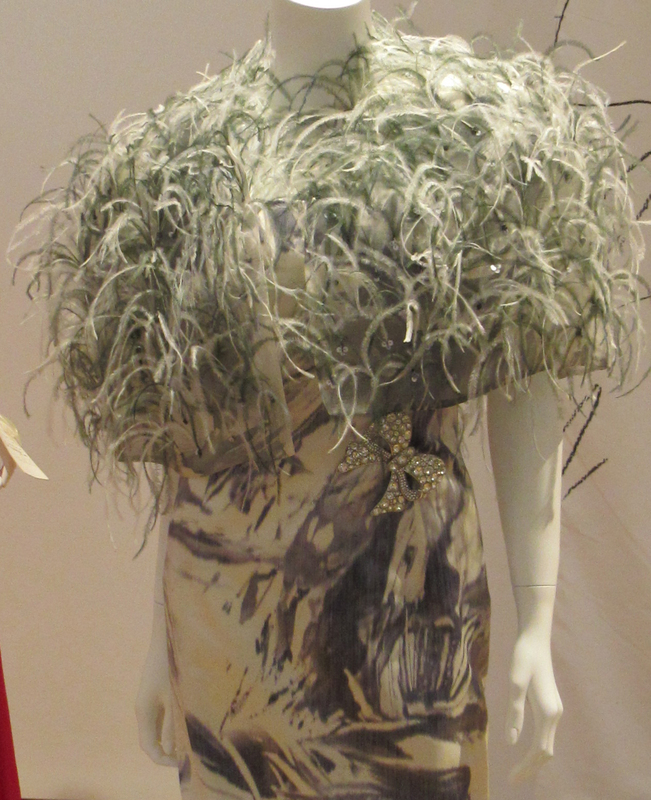 Let me know if you saw this preview at Christie’s or if you have a favorite among Betsy’s couture shown here. I think my two favorites are the red draped Dior at the top of the post and the vivid orange gown above. Betsy sure had great taste and style!